We know what works to prevent chronic diseases. Why aren't we doing it? As a preventive medicine specialist and current president of the American College of Lifestyle Medicine, the second most frustrating thing in my world is how little we do with what we know. We know how to prevent fully 80 percent of all chronic disease and premature death in the United States, and in industrialized countries around the world. We know how to add years to life and life to years. The failure to do it is the second most frustrating thing in my world. I trust this begs the obvious question. What on earth could possibly be the first most frustrating thing? Quite simply, knowing that we are paying for the second with the literal lives of our children and our grandchildren. Yes, of course, we are paying with our own lives, too. But the most frustrating thing of all is looking on, in what at times feels like almost helpless despair, as we consign the medical destinies of the offspring we love to dark clouds, dark woods and dark shadows. Recent reports by the Centers for Disease Control and Prevention revised prior projections for Type 2 diabetes in the U.S. The prior estimates were daunting enough: should current trends persist, by or about the middle of this century, one in three Americans will be diabetic. Trends are similar – a bit worse there, a bit better here – in countries around the globe. One in three Americans with diabetes means well over 100 million diabetics, as compared to the less than 30 million diagnosed today. We are having rather obvious troubles paying the bill now – how can we possibly do it when it triples? And that is even leaving out the far greater human costs. Those projections put not just the fate of our families in question; they put the fate of the nation, our very solvency as a nation, in question, too. But as noted, those projections have been revised – upward. More recent data suggest that 40 percent of “us” will be diabetic, and among ethnic minorities – 50 percent. Why is “us” in quotes? Because, obviously, we are not the adults among whom nearly one in two will be diabetic in 2050. Our day will be over. The adults then will be our children, and our grandchildren. It would be bad enough if we were doing this to ourselves. We are doing this to them. This is not just about diabetes, of course. It’s about all of the chronic diseases we overwhelmingly know how to prevent, including heart disease, stroke, dementia and even cancer. As I write this, I feel a passionate frustration seething, and I am trying to pin down its origins. Why now? The only thing I can think of is an American Heart Association event here in Connecticut at which I spoke last week. The event, a kick-off for a fundraising campaign, was lovely: good cause, good people, good intentions. But the idea seemed to take hold that the best response for dealing with heart disease is for all of us to know CPR. I fully support that, of course. The life it saves could very well be your own, or that of someone you love. Until I spoke, however, there was no mention of a future in which we would need CPR far less often, because almost no one developed heart disease in the first place. It’s almost as if we are in a collective trance, imposed by a culture that keeps inventing new ways to treat chronic diseases while running on Dunkin’; seeing how much sugar can be put into solution and marketed as an alternative to water; willfully engineering food to be addictive; devising inventions to generate new necessities that further erode the remnants of daily physical activity; and pretending that multicolored marshmallows and related ingestible rubbish can possibly be considered part of a “complete breakfast” or any other wholesome meal. We let this happen, every day. We aid it, and we abet it – every day. And all the while, we devise new drugs and devices, new stents and statins – and we learn CPR – to contend with diabetes that doesn’t need to happen fully 90 percent of the time or more, heart disease that doesn’t need to happen fully 80 percent of the time or more. We seem to accept that it’s a midlife right of passage: angioplasty, or CABG? Take a number – have a nice procedure – you can wait in the fast food restaurant – next! Do we truly know how to prevent 80 percent of all chronic disease? Irrefutably, unquestionably, incontrovertibly – yes. The case could be made that we have known since Hippocrates; he certainly had insights about it. But we have known for sure since 1993. That’s 22 years of missed opportunity. So to be fair about what we are now doing to our kids – the prior generation did it to us first, if that’s cause to feel any better. In 1993, J. Michael McGinnis and William Foege published their seminal paper in the Journal of the American Medical Association, “Actual causes of death in the United States.” They propounded the paradigm-changing insight that diseases are not causes, they are effects. They elucidated the underlying causes of the prevalent causes of premature death, and found that all of them – but for a rounding error – could be attributed to a list of 10 factors we have the complete capacity to change, either as individuals or as a collective. Manageable as that list of 10 might be if we had the will to find a way, things can be substantially streamlined. Fully 80 percent of premature deaths and chronic diseases – years lost from lives, and life lost from years – are attributable to just the first three entries on that list: tobacco use, poor diet andlack of physical activity. Bad use of feet, forks and fingers. The evidence for this did not stall in 1993. These very findings have been replicated again, and again, and again…ever since. The findings have been extended into the double helix of DNA: living well even alters gene expression. Studies show that people who make routinely good use of their feet, forks and fingers have 80 percent less chronic disease than the rest of us. And the Blue Zones reveal that these blessings can play out at the level of whole populations living in the real world. There are, in other words, cultures around the world that do not predestine their progeny to a future of rampant diabetes and common recourse to CPR. We of course all understand readily good use of fingers – not smoking – and good use of feet – routine physical activity. But perhaps you think confusion about eating well is a barrier to our progress. 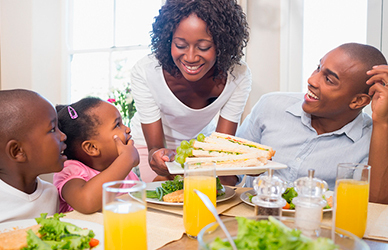 Consider the fundamental simplicity of “eating well.” In one of the important studies about lifestyle and health outcomes, Earl S. Ford and colleagues assessed just four health-related factors: tobacco use, eating well, being active and weight control. They found that four “good” answers (i.e., not smoking, eating well, being active and controlling weight) produced that same 80 percent lesser rate of all major chronic disease over a lifetime than four bad answers. That differential seems to suggest that the measures they used were very, very robust. So what measure did they use to capture “eating well”? Was it a very elaborate analysis based on macronutrient distributions and specific fatty acids? Nothing of the sort. Their marker was: habitual intake of vegetables, fruits and whole grains. The only important thing about that measure in this context is: it was enough! It was enough to distinguish between groups with an 80 percent higher, or 80 percent lower, rate of all major chronic disease over the course of a lifetime. There’s more. Look across the expanse of ambient dietary claims without bias or preconception or an attempt to sell something, and you find that what makes diets good is what makes them alike. An emphasis on what makes them different is good for television, and book sales – but not so good for public health. Michael Pollan famously highlighted the fundamentals of eating well. Others of us have reviewed relevant evidence and reached substantially similar conclusions. This goes much further than most people realize. Consider, for instance, apparent polar opposites in the world of nutrition expertise: vegan, and paleo. I contend that if they are truly expert, and practice a balanced variety of veganism, and a genuine approximation of paleo eating (rather than just using the banner as an excuse to eat pastrami), they are far more like one another than either is like the typical American diet. The one is all about diverse plant foods. The other is about wild animals with flesh in turn derived from diverse plant foods, plus diverse plant foods. Neither is about multicolored marshmallows or any other combination of glow-in-the-dark ingestible junk. Both are about real food close to nature, and so, too, are all other legitimate variations on the theme of healthful eating. If we were serious about giving our kids the future they deserve, we would embrace that theme:wholesome foods in sensible combinations. But apparently, we are not serious – so we devote our time and energy to parsing the variations on that theme, looking for a winner in a beauty pageant. And all the while, more years slip by – and a beautiful opportunity for longer and better lives languishes in neglect. We are not clueless about the basic care and feeding of Homo sapiens. But in collusion with the supply of junk, we create a demand for junk. We conflate junk, and food. We wallow in pseudo-confusion, overlooking the actual consensus, and a far better way forward. We truly do know what to do with our forks, just as we know what to do with our feet and fingers. And so we come to a fork in the road. Along one tine is a perpetuation of my first and second greatest frustrations, and a pressing need for all of us to know CPR we are likely to use. Along the other is the future our children and grandchildren actually deserve. Past the murmurings of our culture, the temptations of collusion, and the distraction of pseudo-confusion, there is an evidence-based consensus about the fundamentals of healthy living – and a better choice along the road, to date, woefully less traveled. Author’s note: Dr. Katz is working to develop a global “True Health Coalition” to advance the proposition that we know enough about the fundamentals of healthy living to eliminate 80 percent of all chronic disease, and that what we know should be put to far better use. If you would like to join this movement, please send your contact information to Susan Benigas, Executive Director of the American College of Lifestyle Medicine, at sbenigas@lifestylemedicine.org.